• For rapid, quantitative, bioluminescent determination of ADP concentration and evaluation of drug effects on ADP metabolism. • Sensitive and accurate. As low as 0.02 μM ADP can be quantified. • Robust and amenable to HTS: Z factors of 0.5 and above are routinely observed in 96-well and 384-well plates. Can be readily automated on HTS liquid handling systems for processing thousands of samples per day. • BioAssay Systems? 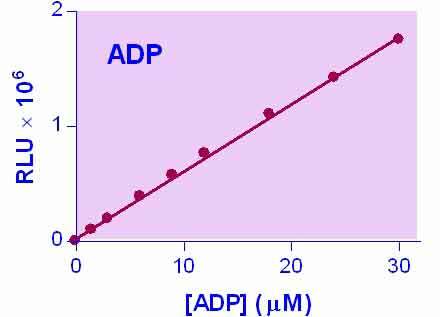 EnzyLight™ ADP Assay Kit provides a rapid method to measure ADP levels. The assay involves two steps. In the first step, the working reagent lyses cells to release ATP and ADP. In the presence of luciferase, ATP immediately reacts with the Substrate D-luciferin to produce light. The light intensity is a direct measure of intracellular ATP concentration. In the second step, the ADP is converted to ATP through an enzyme reaction. This newly formed ATP then reacts with the D-luciferin as in the first step. The second light intensity measured represents the total ADP and ATP concentration in the sample. This non-radioactive, homogeneous cell-based assay is performed in microplates. The reagent is compatible with all culture media and with all liquid handling systems for high-throughput screening applications in 96-well and 384-well plates. 1. As we know, generally ADP Enzyme was made by myokinase. Then, how the ADP Enzyme as a kit component made? Our assay does not use adenylate kinase (aka as myokinase), but pyruvate kinase. 1. Vacirca D et al (2011). Anti-ATP Synthase Autoantibodies from Patients with Alzheimer’s Disease Reduce Extracellular HDL Level. J Alzheimers Dis. 2011 Jun 15. Assay: ADP in Human neuronal cells (Pubmed). 2. Belleann?e C et al (2010). Role of purinergic signaling pathways in V-ATPase recruitment to apical membrane of acidifying epididymal clear cells. Am J Physiol Cell Physiol. 298(4):C817-30. Assay: ADP in Human epididymal cells (Pubmed). 3. Ponnusamy M et al (2011). P2X7 receptors mediate deleterious renal epithelial-fibroblast cross talk. Am J Physiol Renal Physiol. 300(1):F62-70. Assay: ADP in Human epithelial cells (Pubmed). 4. Narain, NR (2011). METHODS FOR TREATMENT OF METABOLIC DISORDERS USING EPIMETABOLIC SHIFTERS, MULTIDIMENSIONAL INTRACELLULAR MOLECULES, OR ENVIRONMENTAL INFLUENCERS Pub. No. : US 2011/0020312 Al. Assay: ADP in Mouse cell (Pubmed).